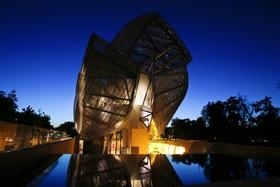 The Pompidou exhibition, “Frank Gehry,” establishes a narrative arc for a career that effectively started with small-scale, experimental wood-frame studios and houses in Southern California and culminates in the Vuitton Foundation in the Bois de Boulogne, which some critics have called one of the most technologically sophisticated, artistically motivated buildings of his oeuvre. A 126,000-square-foot, $135 million structure that formally opens to the public next Monday, it promises to add a major contemporary monument to Paris’s long list of historic architecture. Mr. Gehry’s moment in Paris comes after his Dwight D. Eisenhower Memorial in Washington was approved last week, following a bruising five-year process in which Mr. Gehry’s design went through more than 15 committees and commissions and many adjustments. In Paris, after settling concerns about building in a park, he needed the approval of only one client, Bernard Arnault, chairman and chief executive of the luxury goods conglomerate LVMH, whose foundation owns the new building. “The guy knew what he wanted, and he wanted a building that would be different than anything else anybody had ever seen,” said Mr. Gehry, interviewed over coffee on Monday in his hotel off the Champs Élysées. Mr. Arnault hired Mr. Gehry, he has said, after seeing his Guggenheim Museum in Bilbao, Spain, a spectacle of fluid forms that reshaped that city’s derelict waterfront while enclosing classical white galleries inside. At Vuitton, Mr. Gehry builds on the Bilbao precedent, creating a more complex structure clad in glass rather than titanium. Visitors encounter what looks like a Cubist sailboat, with glass sails and spinnakers rising above the tree line and billowing simultaneously fore, aft, port and starboard. The building appears to glide over a cascade of water lapping down a stepped embankment below its cantilevered prow. The two-story structure has 11 galleries, a voluminous auditorium and multilevel roof terraces for events and art installations. The site is next to the Jardin d’Acclimatation, a 19th-century children’s park and zoo at the north edge of the Romantically landscaped Bois de Boulogne. The architect had to build within the square footage and two-story volume of a bowling alley that previously stood here; anything higher had to be glass. Mr. Arnault’s program for the Foundation, whose stated mission is to stimulate artistic creation, called for a museum with galleries for permanent and temporary exhibitions, and a concert hall. He had two mandates: respecting the park and garden and satisfying the requirements for the galleries. “Once we had the big, basic premise that there was a solid piece for the galleries, which we started to call the icebergs, and then the glass sails for the garden, we started to work them independently,” Mr. Gehry said. “Merging the two would not work, because you couldn’t have curvy galleries, and you can’t hang paintings on glass.” The diaphanous sails, supported on an acrobatic armature of wood and steel, project outside the iceberg. The glass structure takes its place in a long Parisian tradition dating from the 13th-century Gothic Sainte-Chapelle on the Île de la Cité, with its tall walls of stained glass, and the 19th-century Grand Palais, an exhibition hall whose glass vaults echo the vast public spaces of Rome. The Foundation’s fragmented, multidirectional forms recall the Cubism of Braque and Picasso. The mission statement of the Foundation acknowledges 20th-century Modern art movements as a basis of the contemporary art it champions. Visitors enter a tall hall from which angled staircases and meandering paths lead to the galleries and to a roofscape of outdoor terraces enclosed by the glass sails. Between the iceberg and the sailboat, accordion spaces expand and contract, alternately intimate and grand, in what Mr. Gehry called “a chaotic dance.” The white galleries, some with tall ceilings that act as chimneys of light, are “a refuge,” said Edwin Chan, a former design partner in the Gehry firm, who worked with Mr. Gehry and the main project architect, Laurence Tighe. One opens to the sky. Others describe the building less favorably. The architecture critic of The Guardian, Rohan Moore, known for his Spartan architectural attitudes, wrote dismissively, “Everything that is good about the Fondation could have been achieved, and better, without the sails.” Denis Lafay, writing in the online financial newspaper La Tribune, did not criticize the architecture but called the building the ostentatious result of an oligarch’s commodifying of artistic creation to burnish his own brand. At the Foundation, Mr. Migayrou’s immersive show, “Voyage of Creation,” explains the building, with large-screen videos filmed from overhead cranes and drones that flew over and through the building. “I wanted to give a dynamic view of the building, and the films put the building into movement,” he said in an interview. The show includes many conceptual and development models, along with the seminal sketches Mr. Gehry drew on the long flight back to Los Angeles after he and Mr. Arnault first met to discuss the project. In the Pompidou retrospective, Mr. Migayrou includes little-known urban designs for housing projects and town plans, evidence of an urban-planning expertise that he said had informed the organization of all of Mr. Gehry’s architectural work. The exhibition also features a wall of previously unexhibited photographs by Mr. Gehry, who gravitated to raw moments in the cityscape, like cement plants, that his eye made beautiful. “He was photographing the city, the spaces between places,” Mr. Migayrou said.